A tribute to my pastor, Antioch’s pastor, Reverend, Doctor Kenneth R. Kemp. I first became acquainted with Dr. Kemp in 1988 as I worked as a nurse at Brooke Army Medical Center Annex Beach Pavilion. I recall Dr. Kemp, and a couple of his associate fellows in medicine, Dr. Hayes, and a cardiology fellow, who were young Captains/physicians in the Army. The young cardiologist (I forget his name), went on to be with the Lord one day at the very annex where we worked. Dr. Kemp continues to make me proud of all of his accomplishments in his medical career and his Pastorate calling. Many people know of Pastor Kemp’s many distinguished accomplishments, even so, I’ll just touch on a few. 1) Pastor is a United States Army Colonel (Reired) having served his country for 25 yrs. 2) Pastor is a renowned physician practicing in Pulmonary, Critical Care, and Internal Medicine. He is a published author in these areas as well as in Biomedical Ethics. 3) Pastor is a published author of religious instruction books. 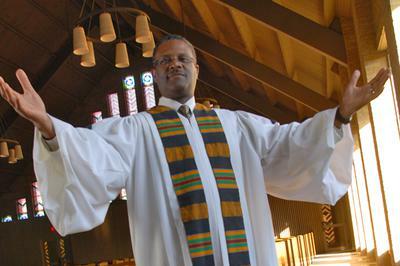 4) Pastor Kemp is recognized around the country as a faith leader. 5) Pastor is a bible scholar, a Shepherd who feeds his flock with knowledge and understanding of the word of God. 6) Pastor Kemp has been married to his childhood sweetheart Velma Kemp for 30 years, they have been friends for 35 years. 7) Pastor Kemp and his beautiful wife Velma have two lovely daughters, Jessica and Joelle who are studying to become a Minister and a Pharmacist respectively. Pastor In your many travels around the world, I know that it was surely the Lord’s divine intervention that returned you and your family to San Antonio when He did, according to His plan, for you to lead the people of Antioch Missionary Baptist Church. Pastor Kemp DOES not only preach his faith; he LIVES his faith, ministering to lost souls as well as the saved. I am Godly proud as he leads by example in his dedication to God, family, the community, and mankind. In my tribute I have borrowed excerpts from the Purpose Driven Life, the scripture based teachings of Pastor Rick Warren. Live Your Calling: What On Earth Am I Here For? Pastor Kemp in our church relationship as Pastor and People, please continue to make an Imprint, Impact and Influence in our lives. Focus not on naysayers who would find a problem in a haystack of solutions. Keep your eyes on Christ for He is coming again. Stand firm in the Lord, and don’t be weary in well doing, the Lord will give you strength, for He is your strength. Through the Trials, Tribulations, Blessings & Conflict, let your mantra be “Jesus I trust you!” When the enemy comes at you, don’t hate, celebrate for Great is your reward in heaven! Be encouraged as you spread the “Good News.” Continue taking your orders from God the Father, and report to Him alone as your higher authority, through our Savior, Jesus Christ. Congratulations Pastor Kemp on your 6th Pastoral Anniversary and, may the Lord bless the Antioch congregation to share many more anniversaries with you and your family.